Sand, exceptional under-water life, and two boating ports : this is a brief summary of what Golfe-Juan has to offer. For a break by the sea : whether you fancy relaxing on a beach, or need ideas for boat trips and sporting activities, or information on scuba diving. 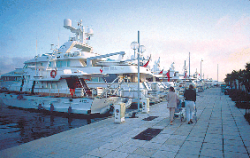 Golfe-Juan has two ports : the Old Port, which is a public port, managed by the Chamber of Commerce and that deals with both the fishing industry and boating for pleasure, and the Port Camille Rayon, the most recent boating port of the Côte d’Azur which was developed in 1989. Enjoy two very different atmospheres : from the traditional port, bustling with fishing activities, to the pleasures of the Port Camille Rayon and its magnificent yachts. On the promenades of the ports there are many shops and terraces to stop and enjoy. It is a real paradise for strollers and boating enthusiasts alike ! Draught : between 2.5 and 1 m.
Maximum boat length : 34 m.
2 cranes for up to 15 T.
Draught : between 5.50 to 2 m.
Naval yard with a lifting capacity of 200 T.